Sorry for the brief lapse in posting… after the “big” snow hit us, it seemed like all we could do was trudge to work, trudge home, snuggle up, and sleep. We did fit in a few good meals, though. This couscous was created on a day when it was just too darn cold to go to the store. So, we gathered a few things from the fridge/imaginary pantry (no pantry..just a bunch of crowded cabinets) and made this little gem of a meal. We’ve had it twice since that night…because it’s just so dang good. Since we usually try to make hearty, meat-y meals when it’s cold (see braised squab, rack of lamb, and gumbo, ETC), this meal seemed a little bit boring when we first conceived of it, but it certainly surprised us. It’s pretty healthy, it’s vegetarian, and it’s quick to make (those 3 things don’t often define our cooking), but it’s also exceptionally tasty. 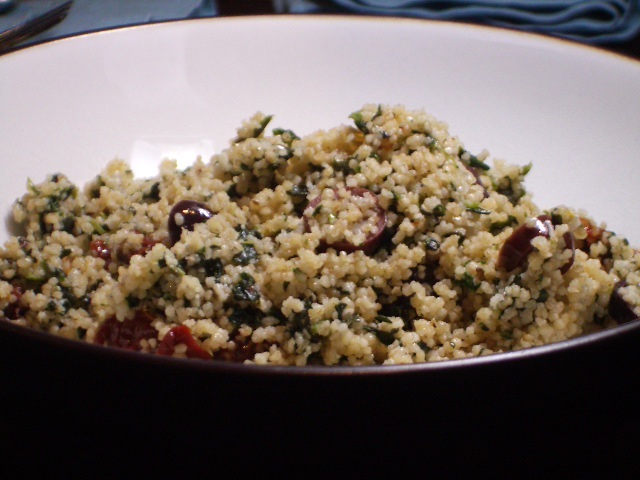 Couscous is a very underappreciated side dish!